ASEAN foreign ministers have endoresed a proposal by Deputy Prime Minister and Foreign Minister Phạm Bình Minh for the ASEAN-China Summit in November to issue an official statement on the start of negotiations over a Code of Conduct for the East Sea. Addressing his counterparts from the Association of Southeast Asian Nations at a meeting on the sidelines of the 72nd session of the UN General Assembly in New York on Saturday, Minh stressed the significance of maintaining stability, overflight and maritime security in the East Sea (South China Sea) for regional peace. He called on concerned parties to adhere to the principles of peaceful settlement of disputes, in line with international law, including the 1982 UN Convention on the Law of the Sea. ASEAN and China should make greater efforts to fully implement the Declaration on the Conduct of Parties in the East Sea (DOC) and build a pragmatic and legally-binding Code of Conduct in the East Sea (COC), he added. Minh also underscored the need for the ASEAN to strengthen its intra-bloc unity and central role in regional and international issues, especially those regarding peace, stability and development. The ministers expressed deep concern over the complex developments on the Korean Peninsula as well as the escalating violence in Myanmar’s Rakhine state. ASEAN appealed to the Democratic People’s Republic of Korea (DPRK) to promptly stop its nuclear weapons tests and strictly abide by relevant UN Security Council resolutions, they said. The ministers called on the DPRK to return to the negotiating table in order to seek long-term and inclusive solutions to the nuclear issue on the Korean Peninsula. The ASEAN FMs also met with UN Secretary General and the President of the 72nd Session of the UN General Assembly Antonio Guterres, with whom they agreed to enhance ASEAN-UN co-operation. Earlier, Minh and the Colombian FM co-hosted a meeting between the ASEAN FMs and their counterparts from the Pacific Alliance. Minh suggested the two sides step up their co-operation in economy, trade, investment, education, people-to-people exchange, science-technology and sustainable development, thus creating a momentum for pragmatic ties. 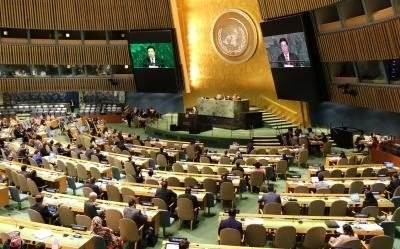 In his address at the 72nd Session of the UN General Assembly (GA) in New York on Friday, Minh said that "maintaining peace is always a top priority, requiring countries to work together to promote multilateralism". The UN, he added, should serve as a coordinator of joint efforts to deal with global challenges based on more comprehensive regulations and standards. Regarding the East Sea, Deputy PM Minh called on all parties concerned to exercise restraint and solve disputes by peaceful measures in line with international law, including the 1982 UN Convention on the Law of the Sea. Also on Friday at the UN, Deputy PM Minh, authorised by President Trần Đại Quang, signed the Treaty on the Prohibition of Nuclear Weapons. The signing reflects Việt Nam’s consistent support for global nuclear disarmament. On the sidelines of the GA, the Vietnamese leader met with the Deputy PM and FM of Nepal and FMs of Venezuela and the Ivory Coast on Saturday and the foreign ministers of Hungary and Saudi Arabia and the managing director of the World Economic Forum the previous day. He also received representatives of major US corporations, such as Boeing, ExxonMobile, Uber, AES, MetLife and Pfizer. The US businesses spoke highly of Việt Nam’s determination to boost comprehensive economic reform, improve the business climate and provide optimal conditions for foreign investors.